Fletcher Lake has history of producing trophy fish. You can expect fast and furious action all season long. Early season, we fish shallow, well protected bays. We follow the fish a little deeper through the mid season. Eventually, deeper structured areas and mature weed beds in the later part of the season. Live bait is available for purchase however, a variety of artificial baits equally boast the same success rate. Of course, you will be able to keep your catch for shore lunch and transport back home per Ontario rules and regulations. If you have never had a shore lunch, then you are truly missing out on a special experience. 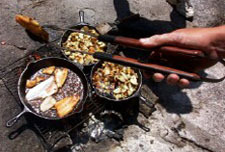 Fresh walleye literally minutes out of the water, filleted and prepared with vegetables and other kibbles, cooked in a frying pan over an open flame on the shore. Now you can enjoy a fresh fish dinner while sitting amid all the beauty that the Canadian forests have to offer! 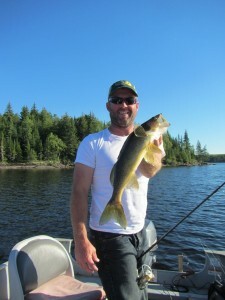 What to bring on your fly-in fishing trip to Fletcher Lake Lodge? When planning a fly-in fishing trip to Ontario Canada, it’s important to bring quality fishing equipment and proper clothing. We have extra gear at the lodge for guests that don’t bring their own, so rest assured we have you covered. We look forward to your visit and know your fly-in fishing adventure will be memorable! What is needed to travel across the U.S. – Canadian Border? Effective 06/01/09 all US citizens must have a valid passport to re-enter the US. A 2004 law is phasing in new rules for travel between Canada and the United States. Since January 2007 U.S. citizens traveling by air to and from Canada have needed a valid passport to enter or re-enter the United States. Beginning January 31, 2008, U.S. and Canadian citizens aged 19 and older traveling into the U.S. from Canada by land or sea (including ferries) have had to present documents denoting citizenship and identity. This change primarily affects American and Canadian citizens who have previously been permitted entry into the U.S. by oral declaration alone, and marks the transition toward standard and consistent documents for all travelers entering the U.S. Acceptable documentation includes a valid passport or government-issued photo identification such as a driver’s license and proof of citizenship such as a birth certificate. Children aged 18 and under need only to present a birth certificate. A list of acceptable documents is found at http://canada.usembassy.gov. Travelers who do not present acceptable documents may be delayed as U.S. Customs and Border Protection officers at the port of entry attempt to verify identity and citizenship. Beginning in June 2009, all travelers, including U.S. citizens, will have to present a passport or other secure document that denotes identity and citizenship when entering the U.S. from Canada. Full disclosure information can also be found on the U.S. State Department website at http://travel.state.gov/travel/cis_pa_tw/cis/cis_1082.html.